For Shabbos, we made a number of new dishes – and we tried some new plating ideas and we actually photographed some of them. I started off with trying a new technique (for me) for the rib eye steak from Bryan Voltaggio. I made a dry rub of fennel seeds, coriander and black sesame seeds with salt and pepper and applied it to the rib eye steak. I picked the black sesame seeds, because I thought it would look nice on the meat. I had never used fennel seeds before on meat and the fennel imparted a beautiful subtle flavor. I took one pound of rib eye, trimmed off all the excess fat I could, and cut it into a rectangular block. I seasoned the block with salt and pepper, then I took a tablespoon each of fennel seed (which I ground up by using a knife and just chopping up the seeds), coriander (dried) and sesame seeds and applied the dry rub to all 4 sides. I then seared all 4 sides of the meat in a hot saute pan – just be careful not to burn the spices (I seared the meat for about 3-4 minutes a side). After searing I put the meat in a 350 oven for about 15 minutes (you will determine how long you leave it in the oven by how cooked you want the finished meat to be – the searing leaves the meat *very* rare). The Potato Confit (confit is a French word generally referring to meat – and it means that the meat is cooked in its own fat and should be very tender – when the word is used with vegetables it means the vegetable should be very tender, I’m using this term, because it was used from the recipe I got from Kenny Gilbert – however, the potatoes were deep fried, so I’m not sure “confit” actually fits this method). I took about a cup of oil, put it in a small pot and heated it up, then I added the potatoes (that I cut into ovals) – I cooked the potatoes for approximately 12 minutes – until they became golden brown, then I salted the potatoes once I removed them from the oil. In the same oil I added rings of onions – pick a small onion, so the rings are small and add the onions *after* the potato – the onions will cook much faster, once they are the color you would like them to be, take them out of the oil. The potato “coulis” is really just a puree of potato with onions and seasonings (salt and pepper) – I was looking to make a thick puree, so that the potato can stand up in it. My husband upon tasting the confit coulis combination thought it would be better with a sweet potato puree. So, I tried that (although did not photograph it) and we thought it worked much better. First of all, you have the contrasting colors, and then the contrasting taste (savory and sweet) was fun. I added minced onion to the sweet potato with salt and pepper and we liked it a lot. The crispy basil – take some fresh basil and in that hot oil – throw the leaves in – they don’t have to stay in long, about 2 minutes – and then take them out. The longer you leave the basil in, the less green the leaves will become and they will burn and not taste very good. I cut up some fresh orange tomatoes and then put the crispy basil on top. You could salt the tomatoes if you want, but I liked them by themselves. We made a 6 pointed challah. This is a fun challah to make for simchas or if you are having a lot of guests – you end up having a lot of challah, so make sure you have friends to share with. I did not take pre-photographs, perhaps next week. If you are interested in how I did this, send me an email and I’ll describe it to you. 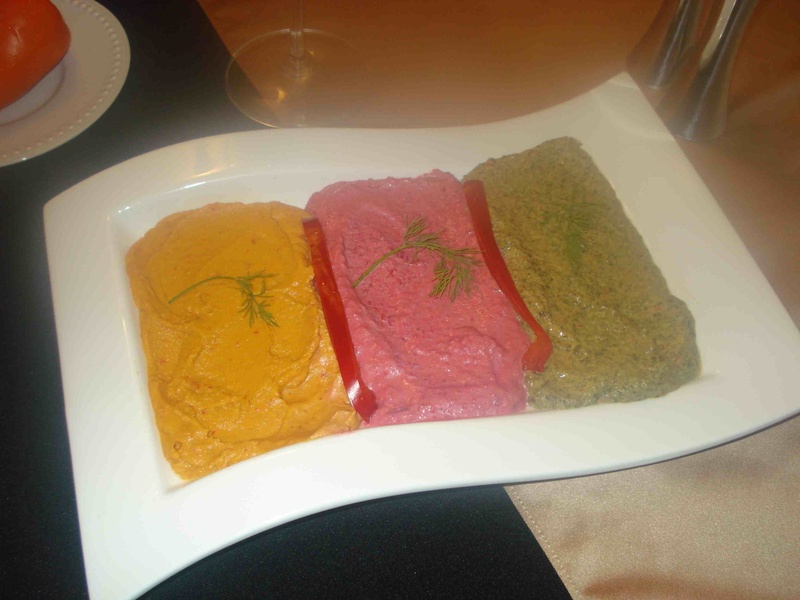 I thought this appetizer came out very well – I modified a recipe from Jacqueline Lombard. She used the apple cup with a liver mousse. I’ve never made a liver mousse, so instead we tried it with a salmon mousse. The apple cup was dipped in lemon juice to prevent oxidation. I picked a salmon mousse as a contrast to the tart granny smith apple. We hear that home-made pasta is delicious and not that hard to do. The ingredients are simple (flour, eggs, salt, oil) and some people say making pasta is well worth the effort. Some others say, just buy freshly made pasta (I don’t know where I could find freshly made kosher pasta, although there is probably someone who is doing it), and some people say just use dried. How fun would it be to boil your pasta for 15-20 seconds for it to be ready? I don’t know yet, I’ve never made home made pasta. But I am willing to try. However, I do not have a pasta maker. Do you need a pasta roller to make pasta? No, you can do it by hand (ravioli) or use a rolling pin. However, if you want your pasta to be uniformly thin, and you are a relative novice to pasta making – a pasta roller will achieve uniformity and thinness (there are typically 9 settings of thinness, from thick (1) to see-through (9). And, it’ll be faster. I want to borrow a pasta maker because, although I will buy one, I’m not sure which one I want to buy. Kitchen Aid has an attachment that will fit on my mixer, but will it work? I don’t know. And having a pasta maker sit on your counter (presumably attached to the counter with some kind of vice) looks neat. So, I just got 2 more leads as to where I might be able to borrow a pasta roller. I’ve seen recipes that I’ve wanted to try for years. When we were living in the Old City of Jerusalem, my husband would get the paper. Every Thursday would have the food magazine (which I’ve saved). And they had about 20 articles on making your own pasta. They mostly have raviolis with different fillings, but still, they sounded easy enough to do. So, we are on a quest. We heard of someone who might have a pasta roller to lend, and it turned out they didn’t, but their daughter in law had heard of someone with one, so we’ll see how that turns out. 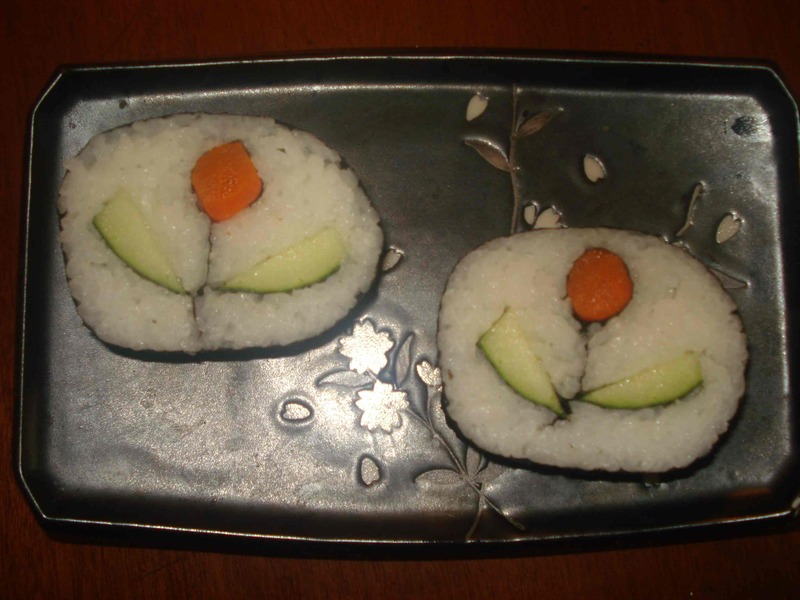 Hopefully, it looks like a flower to you. I got the idea from a book I saw (and I’m going to have to see if the library has it, because my local bookstore doesn’t and I couldn’t find it online). I am not sure how they made the carrots circular, I’m wondering if there is a carrot corer – like an apple corer. If so, that would be vastly easier than my first attempt of using a knife to make the boiled carrot circular. Not such a good plan, or at least not with my knife “skills”. Then I tried a peeler which worked much better and it made the carrot more uniform and circular-like. I’m hoping to make a couple more designs this week, and if so, I will post them as well. We hosted a Sheva Brachos and we started off the first course with Fried wontons. First of all, fried wontons are delicious, and are easy to make. Buy some wonton wrappers at your local grocery store (I don’t know why, but they are often in the refrigerated produce section). I bought the smaller wontons, if I were to do it over, I think I would buy the larger wrappers, why you ask? Because although smaller ones are cuter they take a lot of time and you can’t put as much filling in. Pick up some cream cheese, and whatever you want to use as your filling. I picked mock crab this time around, although I have done them in the past with apricot – which was also yummy. I made three per person. 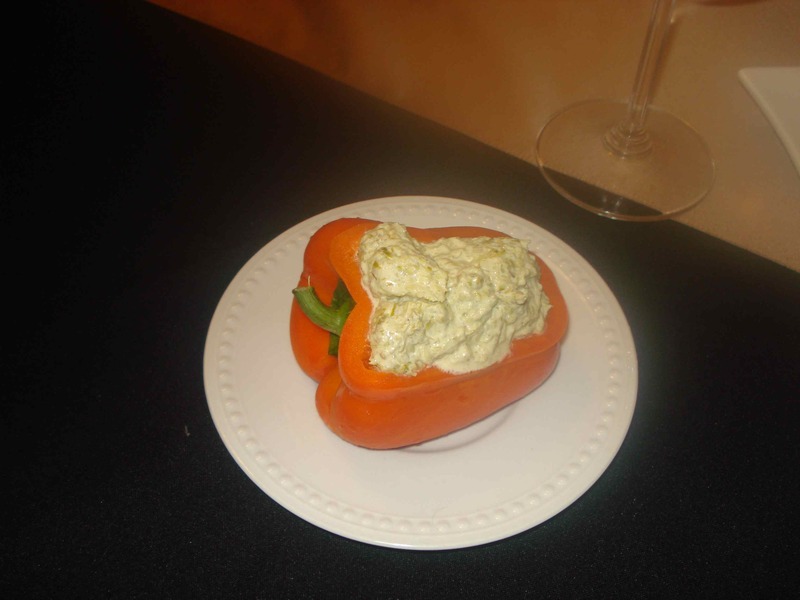 Bring cream cheese to room temperature, then mix in the egg, add the salt, pepper and parsley and mix. (If you like Old Bay Seasoning, add some Old Bay – somewhere between a teaspoon to a tablespoon, depending how much you like it). Lay out 9 wrappers in front of you and put 1 teaspoon of filling in the middle (if you are using the larger wontons, then put a tablespoon), then cut up some of your mock crab and put in a couple of pieces. Then, wet the edges of the wonton and close the wonton completely, if you miss a part your filling will leak out while you fry them. I brought all 4 corners together and sealed the sides together, but you can close them up however you like. As you are putting the wontons together, start heating up the oil. You need about an inch and a half of oil covering the bottom of the pan. When the oil is hot enough, the wontons when dropped in will cause the oil to bubble slightly, so you can drop a little piece of wonton in to see if it fries up. If you try to fry the wontons and the oil is not hot enough, you will get soggy oil filled wontons (ick). While you are working with the wonton wrappers, cover them with a damp (wet and then squeezed out) paper towel. This will stop the wontons from drying out. (You have to squeeze the water out, because too much water = soggy and unusable wontons). I found these wontons good without a sauce, but you could make a quick an easy sauce to go with this. An apricot sauce could be good (see below), as could a spicy mustard sauce, or even a dill sauce. I have also filled the wrappers with cream cheese and apricot jam. Add a tablespoon of sugar to the cream cheese and egg mixture (and delete the other ingredients) and then add half a teaspoon or teaspoon of apricot jam to each wonton. I then serve an apricot sauce with these wontons (take 1/2 a cup of the apricot jam and add a tablespoon of water to make a thinner sauce, add another tablespoon of water if the sauce is still too thick). This year we made Ethiopian Shaloch Manos and it was a culinary adventure. We made Kik Wot (Red Lentil Stew) and Injera (a sourdough crepe-like flat bread). First we had to find all the ingredients. Injera is made with Teff Flour – a protein packed grain found in Ethiopia. Here I got it from Bob’s Red Mills in Whole Foods (I tried to find it closer to home, but the supermarkets didn’t have it, nor the local health food stores, hooray for Whole Foods). Then the red lentils were also found at Whole foods. Red lentils are fantastic, not only are they good for you, they change color! That’s right, they start off a salmon color and when heated turn yellow. Red lentils make a great soup or a side dish. Three days before you decide you want to make your Injera crepes – put all the ingredients together – the teff, regular flour, water, salt. Then let it sit for three days, outside of the refrigerator. Three days. I know, kind of weird – but if you have ever made sourdough bread, this process is totally normal. And with luck, you will get the mixture to ferment. Fermentation is key to get the bubbles, and the bubbles are key for the Injera to look like it is spongelike when cooked. After the ingredients were gathered, I checked and washed the red lentils and then sauteed the onions in oil until translucent and then added the minced garlic and then added the Berbere – an Ethiopian spice mixture similar to curry in that everyone makes it a little different, but the primary spice is Paprika. Please see below for my recipe for it – (it called for Fenugreek and cardamom – neither of which I was able to find with a Kosher certification, so I left them out). That mixture sauteed for about 5 minutes, then I added the diced tomatoes. Then I added the red lentils and the water. Then I let it “stew” for about 2 hours. In the end, the mixture should be thick and stew like – not a thin soup, so if you end up having too much water, let it boil off. In Ethiopia, apparently, they use only Teff flour for Injera, but in America, most Ethiopian restaurants (according to the brief research I did on the internet) use regular flour with the Teff to create a milder flavor. While the red lentils are stewing you can make the Injera. I used a crepe pan, but you can use any circular sautee pan. The Injera batter had bubbles floating at the top which let me know it did ferment and it smelled sour dough-y. I took about 1/4 of a cup and poured it on the heated pan with a little bit of cooking spray. Then as it heated, the bubbles came to the top and made the sponge like consistency. You cook it like a crepe – but you only cook one side, no flipping. It took about 2 minutes for the crepe to be fully cooked. After everything was cooked, if it is a “real” Ethiopian meal, you put the Injera down on a platter and put the stew on top of it (the Injera soaks up some of the juices). Then it is served with extra Injera to be used as utensils – you tear off pieces of the Injera and use it to scoop the stew. After all the stew is scooped, then you eat the bottom layer of Injera (which is delicious). If anyone tries this and wants extra information or pointers, just give us a call. Purim Sameach! Happy Purim! Mix all of the above ingredients. I made this mixture only for the red lentils, if you are going to use this mixture for a lot of different uses, most people add minced garlic and onions to the dried ingredients and then sautee it, but since the red lentils had garlic and onions in it, I didn’t add them to the Berbere. This amount made a little over 30 cups worth. Enough water to make a slightly thicker than crepe like consistency – approximately 8 cups of water split into 2 cups and then add the rest. Mix the flours and salt and add 2 cups of the water. Knead the dough. I had read that kneading the dough first helps develop the gluten and makes it better. So, I did this, for about 30 minutes (it was fun, and the Teff flour makes for a very silky fun texture). Then I added the extra water – and the gluten didn’t dissolve after a day. I was nervous I was going to have to toss the mixture and start again, but I just left it sit in the water, hoping the flour would dissolve after 2 more days, and it did just that. When I was ready to make the Injera, I had a lot of bubbles – and it was slightly thicker than a crepe batter. This mixture works just like a sourdough mixture, so you could save some and use it as a starter for the next time, if you want.